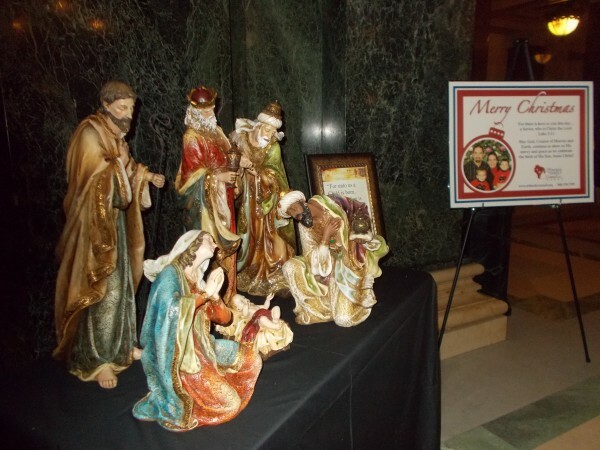 Badger Catholic Blog had a news item about the Freedom From Religion Foundation placing an irreverent nativity display in the Wisconsin State Capitol rotunda. Since that’s 4 minutes walk from me, I decided to go see what was up. Although it’s not actually Advent till Sunday, it turns out Christmas is very much what’s up; Governor Walker just today officially lit a huge beautiful Christmas tree on the first floor of the Rotunda, covered with handmade ornaments, many of them explicitly Christian, from children all over the state. It’s really a sight. It even has an electric train running around the base. 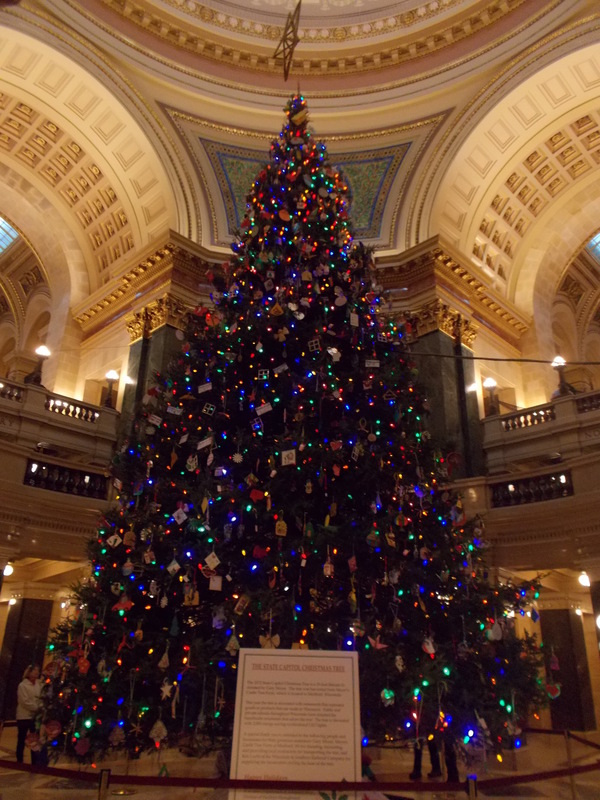 The Wisconsin Capitol Christmas Tree 2012, with thousands of ornaments made by Wisconsin children. Please excuse my poor photography. The tree is decorated with ornaments made by Wisconsin school children who were given the theme, products made or grown in Wisconsin. Thus there is an otherwise-baffling number of ornaments depicting Tombstone frozen pizza, and ornaments made out of half-pint milk bottles, etc. Students from Sacred Heart Catholic School delighted me with their heart ornaments proclaiming God’s love growing at their school. Why, you ask, didn’t I take another picture where the bow was not obscuring part of the text? 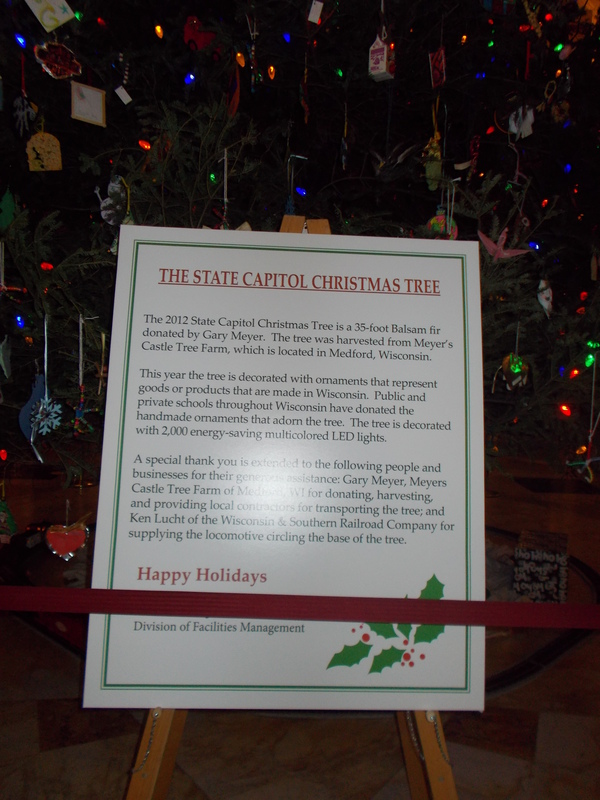 Because there was a policeman hovering very near me zealous to guard the tree. This is good. They do not want the ornaments messed with. 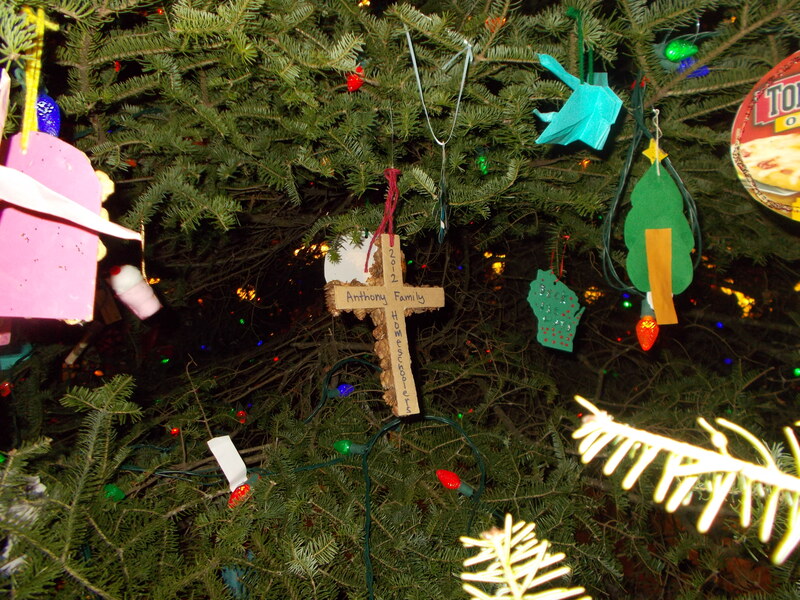 The Anthony Family Homeschoolers were also not interested in secularizing Christmas. 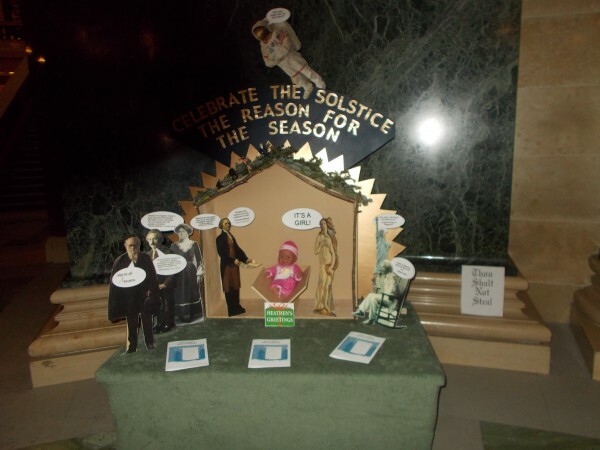 Wisconsin Family Action had a Nativity display. The Word became flesh, and dwelt among us. God Himself is revealed through the family, and through Christ we have become members of God’s family. In the Holy Family human and divine life are guarded with profound reverence, all our Good is here and will be given and shared; the gift of God is for all people. I explained it was a blasphemous protest against Christmas. “Oh, I don’t agree with that,” she said. Neither does any person of good will! Christmas is alive and well, and it may do you and your family good, if you are in the vicinity of Capitol Square, to stop in and see the big delightful Christmas tree, and the (real) Nativity scene upstairs. 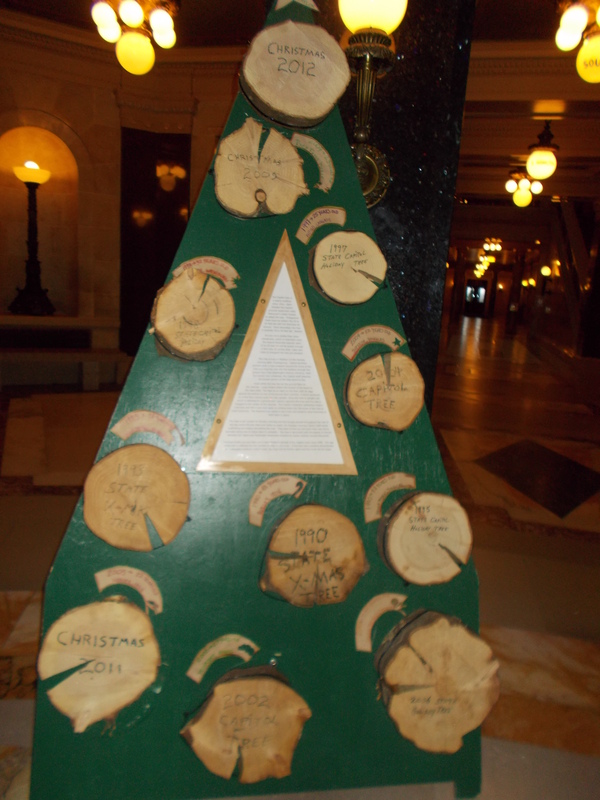 The FFRF thing as you can see is sort of pointless. 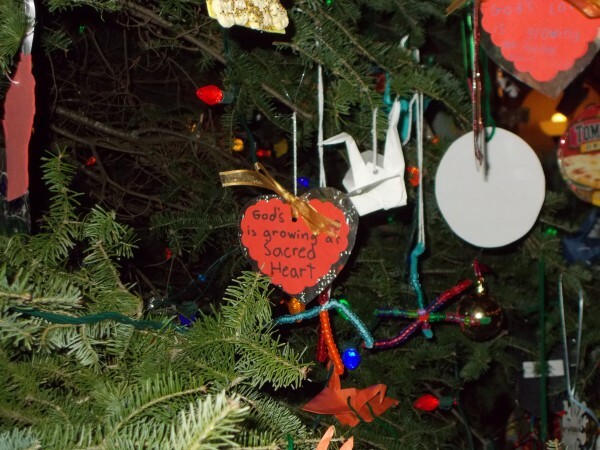 Christmas is about Jesus, Mary and Joseph, and it’s about your family, but it’s not just in the stable in Bethlehem and not just in your home, but public and for everyone’s joy. It’s made me think. In recent years I’ve done hardly anything to decorate for Advent or Christmas. I want to now–I hope to outside too somehow. Around town lately I’ve found myself looking and looking to find any signs of sincere Christianity, aside from actual churches. I found a house with beat-up concrete statues of Mary and Joseph recently and was really quite thrilled. Make the Sacred visible, in as beautiful a way as you can, and I believe you will give encouragement to someone. Very nice, Elizabeth! You remind me of another friend, who also takes a supernatural view of Christmas decorations. He feels the time spent planning & arranging is a direct corollary to time spent preparing oneself spiritually during Advent. As long as the former doesn’t supercede the latter!